Well, it’s more like a slight bump, but we’ll take it. The cast of The Hills is reuniting for a new show, The Hills: New Beginnings, they announced at the VMAs. (“It’s like we’re all growing up, it’s weird,” they say in the teaser.) And by cast we mean … some mix of the original members? According to the release, the show will “reunite original cast members, alongside their children and friends, and follow their personal and professional lives while living in Los Angeles. 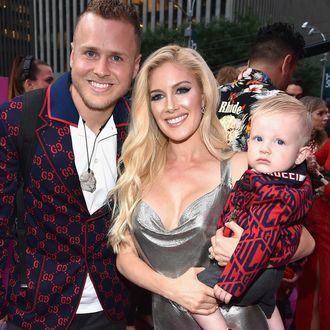 With new faces in the picture and returning favorites.” So let’s just go ahead and assume that it will be Heidi and Spencer Pratt, Audrina Patridge, JUSTIN BOBBY, Jason Wahler, Stephanie Pratt, Frankie Delgado, their spouses, and babies — who all appeared on the red carpet to tease the revival — rising from the reality-show ashes to carry on the Hills legacy without the ones who paved the way. Rumor has it that Lauren Conrad and Kristin Cavallari, the original series’s stars, will not be involved, and neither will Whitney Port. (Kristin has her own reality show over on E!, while LC lives her reality on Instagram now.) We’d say thank you MTV, but YOU KNOW WHAT YOU DID.